I definitely was a little unsure about these apple chips! January seems to be the month where everyone is running around trying to “get back on track”; back to school or work, back to saving money, back to eating healthy, back to the gym, etc. 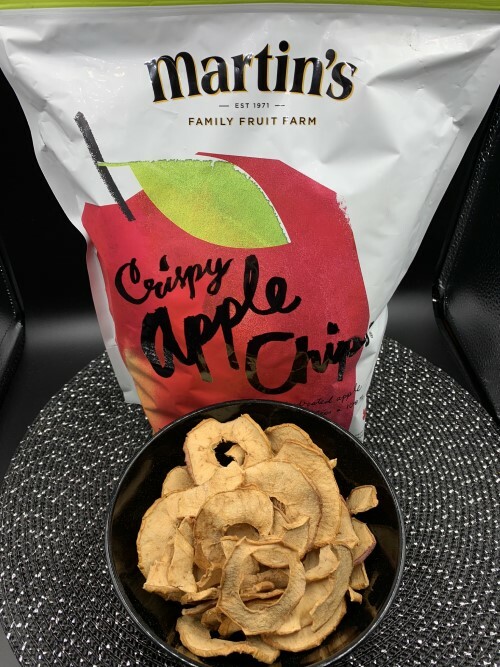 To be honest, I’ve actually seen Martin’s Crispy Apple Chips at Costco many times, but I’ve always been turned off by the price (and the concept of apple chips didn’t interest me that much either). However, they seemed like they had good potential as a “get back on track” snack, so when I saw them on sale at Costco, I didn’t hesitate to grab them. Despite my skepticism, these apple chips turned out to be a pleasant surprise! It was actually hard to stop eating them! 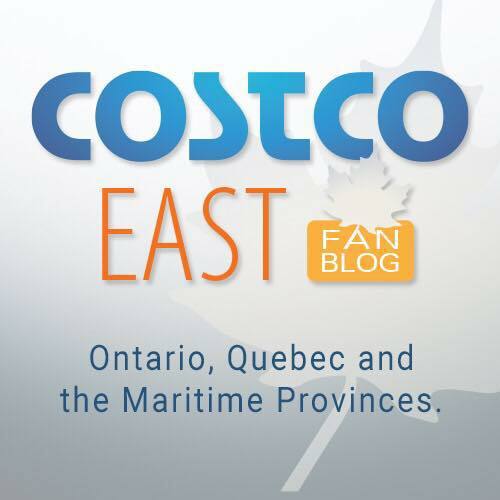 I tried them with my husband while we were trying some other Costco chips (of the less health potato variety), and I kept wanting to eat more of these apple chips rather than the potato chips. They’re pleasantly crunchy. At first they taste like a sweet chip, and as you chew them, they soften and the taste and texture becomes similar to fruit leather. They’re not overly sweet, and the crunchy texture makes them unique and addictive. 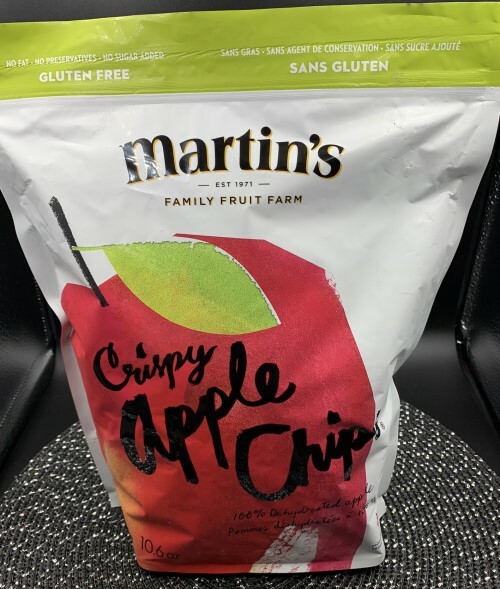 As I said before, Martin’s Crispy Apple Chips have always struck me as being a little on the pricey side; the bag isn’t huge, 300 grams and the regular price is $7.39 Canadian. 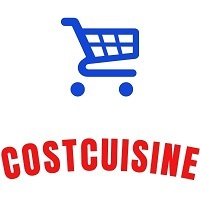 I purchased mine for $2.00 off, so $5.39 for the bag. $5.39 seems pretty reasonable to me, but any more than that feels expensive for dried apples. The apple chips are a very convenient item to have on hand; they make a great snack alone, but also work great in combination with plenty of other foods. You could add them to your trail mix, sprinkle them on your morning oatmeal, put them in yogurt or on a bowl of cereal, use them as toppings for pancakes or waffles, eat them with a cheese string or dunk them in peanut butter (my favorite idea). If you wanted to get a little bit more adventurous, I could even see them working well in a salad. The bag is re-sealable, which I always love. The best before date is a few months after purchase, so if you reseal the bag, the chips should last a while. The bag states that the apple chips are gluten free and contain no fat or added sugar. They’re simply dehydrated apples, as evidenced by the single ingredient listed on the bag: apples. Just out of curiosity, I wish they specified what kind of apples the chips are made from. Fuji? Gala? Honeycrisp? Most people probably won’t care as much as I do, so that’s a very minor nitpick. Anyway, seven apple chips contains 45 calories, zero grams of fat, seven grams of sugar and one gram of fibre. As these chips are just dehydrated fruit, it’s much easier to overconsume and eat the equivalent of three or four whole fresh apples (something I would guess most people wouldn’t normally do). Also, after some research, I learned that some of the vitamin C and fibre are lost in the dehydration process, so these chips aren’t quite as nutritious as a regular apple. At $5.39, I would repurchase again. At $7.39, I think would hesitate even though I do like them quite a bit. I could definitely see kids loving these. When I put the bag in my cart, I pictured myself bringing these to work to share with my coworkers, but after trying them, I wanted to keep them all to myself! I’ll easily be able to polish off this bag. Have you had these before? Did you like them? What’s your favorite dehydrated fruit? I absolutely LOVE, LOVE, LOVE these!!!! Not just for me but for my Zuchon as well…she LOVES, LOVES, LOVES them and so healthy for both of us!!!! My elderly mom swears by it for healthy digestion. I have had one bad bag out of about 100 good bags!! Try them again! They are Reallly good! We liked these so much that we make our own. We purchased a food dehydrator and, when apples are $0.50 per pound in the fall, we dehydrated 50 pounds of apples! We sealed these in vacuum sealed bags and have apple chips all winter long. That’s such a good idea! I love vacuum sealers for things like this. The ones in your picture look good. Mine are small and have lots of dark spots and seem “burnt.” Did your whole bag look like that or did you pick out nice ones for the photo ? Maybe I got a bad batch? I was thinking I would not buy again. Honestly this is what they looked like, all I did was dump the bag into the bowl! That’s weird yours had dark spots and seemed burnt. Maybe if you have them you could return them? I would recommend sprinkling some Cinnamon into the bag then gently tossing them (i just sprinkle in then seal and rotate the bag). it tastes amazing.